Speed up, take off and sail like an eagle across the hilltops with a big grin on your face. The "Eagle Line” fun piste at the Kitzsteinhorn guarantees cries of joy from children – but big adventurers and snow park beginners let the happiness hormones take over here too. Physical forces can be felt in the Eagle Line – and this with a lot of fun! Racing full speed through the banked curves, you are exposed to centrifugal force and you defeat gravity when you take off at the gentle hilltops. The different obstacles are easily compensated. 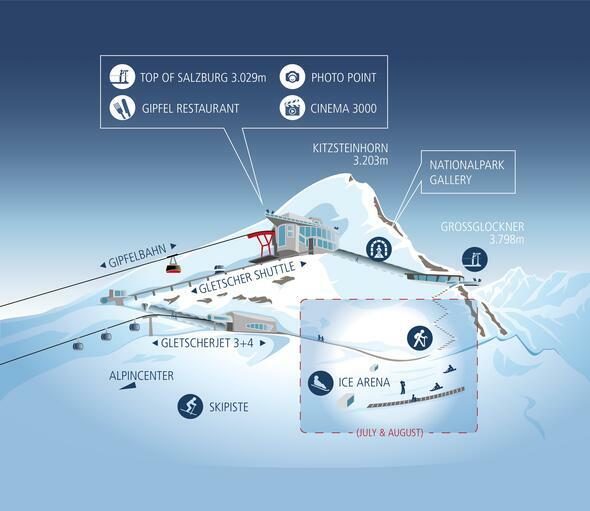 The "Eagle Line" provides plenty of fun in the heart of the glacier ski resort at the Kitzsteinhorn. The artificially created parcourse is around one kilometre long and is steeped in waves, banked curves, hilltops and changing obstacles. The speed and difficulty on the "Eagle Line“ increases steadily, thus even beginners and children can slowly get used to the different features of the terrain. Experts take off like eagles at the individual jumps and race through the banked curves at high speed.